Exhibitions are always more than the sum of their parts; they are systems that develop in time and space, influenced by a number of factors, including the juxtaposition of different forms, ideas and people in an exhibition space. They produce results that can’t be fully anticipated and aren’t entirely clear until the exhibition has run its course. In this sense, they are nonlinear systems, which are partly constituted by the interactions between their parts. A nonlinear approach to systems looks at the emergent properties ‘of the combination as a whole – which are more than the sum of its individual parts’. The artists in Systematic deal with systems in nonlinear ways by incorporating organic, linguistic, pictorial, digital, cultural or bodily processes into their works with various results. In many cases, they reveal that consumption and production can become one and the same moment, that in looking at an artwork or an exhibition, we are contributing to its production, its meaning and completion, while it too acts on us. These artists also tend to turn the idiosyncrasies of a system into the material or motivation for artworks. They embrace and sometimes even intentionally provoke the quirks, errors and failures of systems and exploit them as creative content. This results in intriguing artworks, while simultaneously providing a much-needed critique of systems that otherwise risk becoming naturalised, with their positive and detrimental effects unconsciously assimilated into our daily lives. Contemporary artists have repeatedly toyed with the modernist exhortation for form to follow function. Justin Beal addresses this notion with an artistic practice that playfully uses the entropic tendencies of nature to critique the civilising drive of utopian design. In his sculptures, organic matter collides with man-made building materials, such as plasterboard, glass and concrete, to question the validity of modernist principles and reveal the blind spots of utopian architecture and design. 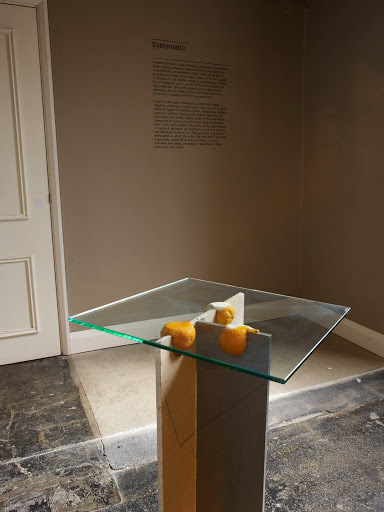 Beal’s fruit tables, all called Untitled (Orange table) (2007), are rudimentary constructions of drywall, glass and oranges, which inhabit the gallery in visual, spatial, olfactory and sonic ways. The fruit, which decays over the course of the exhibition, generates ecosystems involving bacteria, fungi and insects. In performing the full cycle of living, reproducing and dying, the sculptures introduce insecurity into an almost naturalised lexicon of modernist materials and practices. For Beal, they ‘illustrate the inevitable awkwardness of containing a human organism within a structure made of glass and steel and sheetrock’. By allowing natural systems to run their course within the highly civilised context of the art gallery, Beal also celebrates the unpredictability and undecidability that befall all works of art once they leave the artist’s hands. The sculptures stage a duel between form and function: they have legs and tops and look like tables, and they might be used, were it not for the unstable surface caused by the rotting fruit. In so fooling us, they challenge the ethical codes of systems developed to the end of function alone. As the oranges rot and collapse, the glass tabletops eventually teeter at improbable angles, introducing chaos, humour and slapstick into the earnest domain of modernist practice. By fudging the distinction between furniture and sculpture, Beal creates objects that ‘float somewhere between use-value and art-value’. Neither wholly art, nor entirely without use, they confound expectations and operate a dynamic movement of to-and-fro between these two systems. Life and death cycles are a recurring concern in Damien Hirst’s work. From an oversized ashtray filled with detritus collected at the Groucho Club in the 1990s – the metaphoric ‘corpses’ of the party – to his seminal work A Thousand Years (1990), in which a decaying cow’s head is the breeding ground for a colony of flies later zapped by an Insect-O-Cutor, Hirst’s work has repeatedly staged the production of life and encapsulated the moment of death. Internal Affairs is a series of vitrine sculptures created in the early 1990s, which seem destined to accommodate the human form. The vitrines contain the paraphernalia of workplace, hospital or laboratory, and are just the right size to accommodate Hirst’s body, making them sculptural self-portraits fraught with anxiety. With their heavy metal edges, these works resemble the triptychs by Francis Bacon, one of Hirst’s artistic idols. The glass structures also resemble cases from a museum of natural history, though their contents suggest they are intended for a living person, again highlighting the proximity of life and death. Glass had perhaps its most famous – and infamous – outing in contemporary art with Marcel Duchamp’s La Mariée mise à nu par ses célibataires, même (The Bride Stripped Bare by Her Bachelors, Even), or Large Glass (1915–23). The work has been the subject of a proliferation of hermeneutic literature that began before the work was even finished. It has been seen as a manifestation of Duchamp’s ‘passionate and bitter, and ultimately checkmated, love-hate relationship with art and with the people around him’. One psychoanalyst went even further, maintaining that the work was a symptom of the artist’s schizophrenic tendency to ‘act as though there were a pane of glass between [him] and others’. According to Duchamp’s biographer, the artist concurred with this criticism, claiming that ‘he had passed entirely through the Large Glass, behind which he had then spent a good part of his life, “entirely ignorant of the gravity of my condition.” In any event, the line of filiation that can be traced from Hirst’s vitrines back to the Large Glass makes particular sense in relation to Sometimes I Avoid People (1991), a work whose misanthropic title matches its potential for physical seclusion. 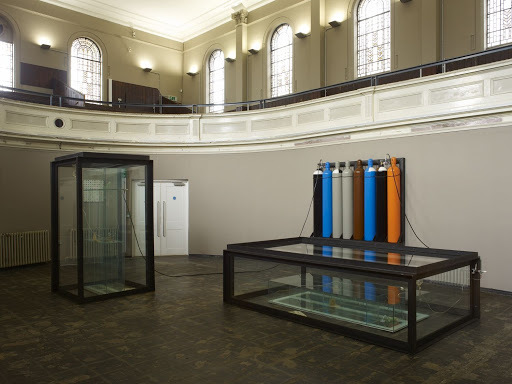 The work consists of a pair of Hirst’s signature vitrines, which contain smaller cases built to the specifications of Hirst’s own body, with holes cut for his head, arms and legs, along with basic medical equipment required for breathing and excretion. On the wall beside the vitrines is a set of eight canisters containing the gases required for human survival. The work is a survival space, an escape microcosm in which a body’s basic systemic needs are seen to. It is a wry comment on the controlling tendencies of society; in a misanthropic and clinical way, it acknowledges the connection between the basic human desire for solitude and the precariousness of bodily systems. Cory Arcangel’s work uses contemporary digital technology and impishly subverts it to realise its latent potential. To make the video Apple GarageBand Auto-tune Demonstration (2007), Arcangel passed a video sequence of Jimi Hendrix’s rendition of The Star Spangled Banner through an off-the-shelf computer program designed to correct the pitch of music. Pitch correction is partly to blame for the barrage of identikit pop tunes filling the airwaves, and as such it’s a tool whose usefulness is highly contentious. By applying this supposedly ‘optimising’ process to a performance already lauded for its excellence, Arcangel infects the contemporary logic of ‘perfection’ and uses the tool against itself to demonstrate its absurdly reductive reasoning. And indeed, the resulting tune is drab in comparison to Hendrix’s original. Apple GarageBand Auto-tune Demonstration links the processes of consumption and production to create an aesthetic out of the workings of a particular system, in this case a computer program. Through a dual process of consumption and production ‘the aesthetic produced by those things becomes my work, which is basically exploiting the way the whole art system works’. For better and worse, this kind of exploitation is inherent in the system of the art world, in which stasis can lead to players becoming cogs in a machine. Such a system seems to naturally submit to an ethic of creation through an ongoing process of mutation and survival of the fittest. In relation to our use of digital and online systems, Arcangel sees that ‘production itself has become consumption’ or, to put it another way, using applications such as Twitter (or Facebook, or webmail systems) constitutes an act of production both online and in the ‘real’ world. Even supposedly passive Internet habits create browsing histories and cartographies of participation, and such micro-systems are intricately bound up with global macro systems. The allure of systems – the fluidity and apparent magic of their processes – can often be attributed to their impenetrability. We may think we know how a system works, but a quick exercise in deconstructing it will reveal a wealth of unimagined and complex connections between its parts. There is often a wide gap between our superficial understanding of a system and its actual mechanisms, and this distance provokes curiosity and awe. Cave paintings, as a system of signs we can’t fully work out, are situated in the remote past, whereas the solar system stretches out into the far reaches of space. The cosmos is a baffling reality that is perhaps more easily accessed by flights of fancy than those of a spacecraft. Occasionally, as in Katie Paterson’s Earth-Moon-Earth (Moonlight Sonata Reflected from the Surface of the Moon) (2007), poetry and technology are reconciled. Earth-Moon-Earth (EME) radio-communications technology allows people on Earth to make radio transmissions to the Moon, from where they are bounced back to Earth, weakened by losses to the shadows and craters of the Moon’s surface. Paterson chose Ludwig van Beethoven’s Moonlight Sonata, a romantic and wistful composition from 1801, as the cultural artefact to be translated from musical notation into Morse code and beamed to the Moon. The returning code went through a crucial stage of interpretation and was re-translated into notes to form a workable score. In one particular installation of the work, the data was used to make a perforated score, which was fed through a self-playing piano to produce what Paterson has called a ‘strange and ghostly effect’. The work is constituted by the limitations of and interstices between the systems it uses, the losses and slippages of meaning incurred in translations between the languages of musical notation, Morse code and radio waves. Charles Sandison also works with technological systems, to explore the movement and flow of life, language and images. Working with light – and more importantly, with darkness – Sandison sets up complex moving projections of signs and symbols to create immersive environments. In Reading Glass (2005), points of light emerge from various architectural features in the gallery and rove the space, seeking partners with which to form recognisable signs. The points of light represent the full stops from Charles Darwin’s On the Origin of Species (1859). They coalesce to form the words of the text in a hand-written script based on that of Sandison’s daughter from the time when she learned to write. The lights move according to a genetic algorithm that mimics the behaviour of bacteria; they consume and produce the text through processes of feeding, reproduction and decay, with lights brightening and fading, to eventually run through Darwin’s entire treatise. Many of Sandison’s works, including Reading Glass, are influenced by a combination of control and chance. The binary code that regulates the movement of the lights seems decisive – it’s either ‘on’ or ‘off’ – but mistakes in that code play an important part for Sandison: ‘My work has grown up around them; they are like genetic mutations, they allow the work to develop in ways I can’t necessarily predict but can later comprehend’, by correcting them. 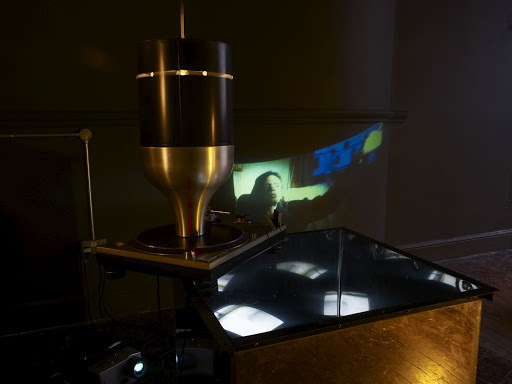 Because it is based on computer code that evolves and develops over time, rather than on the looping techniques of video-based art, Reading Glass takes an indefinite amount of time – around 25 years – to run through Darwin’s text, reminding us of the slow and ongoing processes of evolution. A willingness to embrace the errors and shortcomings of a system and turn them into art runs through several of the works in Systematic, from a pursuit of the inherent incompleteness of EME transmissions to an interest in evolving and regressing computer programs. Error is also the raison d’être of a group of unique photographic prints by Sean Dack. This Glitch series comprises kaleidoscopically distorted pictures that have a familiar, spectral quality, with an original source image appearing as a background murmur overlaid with striations and geometric patterns. These works feature the disruptions that occur in digital imaging systems, and in the conversion of images from digital to analogue formats. 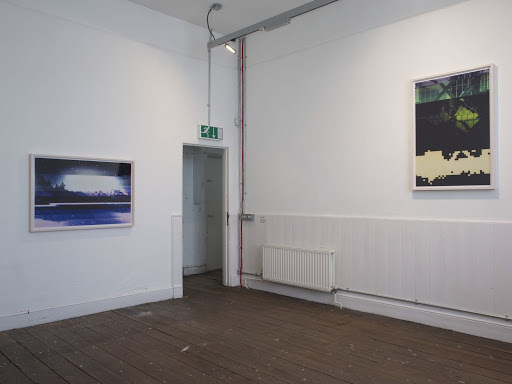 Dack’s source images range from portraits and landscapes to pictures of contemporary architecture; they are recognisable tropes of the visual arts. Through a variety of controlled and aleatory processes, the artist interferes with the transmission of data packets, the bundles of information that constitute digital versions of images. This interference happens during the download process, when bits of data are deliberately lost or displaced and rearranged, or is provoked by repeatedly scanning and printing the images. Scanning transfers an analogue image – a physical print of a photograph – to a digital file, whereas printing does the opposite, producing a print from a series of data packets held on a computer. These processes highlight the impossibility in analogue to digital transfers of exact translation, a problem that dogs all languages, and an existential issue that we ignore at our peril. There is also an element of chance in the visual form of these transmission and translation errors: it’s impossible to predict precisely which bits of information will be lost. However they emerge, Dack treats these glitches as his raw material, working and reworking them into the final image. By using images to highlight a specific problem in the relationship between digital and analogue systems, Dack unsettles a core part of our everyday communications: the digital and visual mass media cultures we rely on daily to access the ‘truth’ of the world, and within which we are ourselves deeply embedded. For Dack, working with images in this way ‘is a way of being in the system while turning it on its side, remixing the code by which we understand and read an image and therefore, the world.’ And he does so in a resolutely aesthetic way, sensitive to the beauty that can be achieved by harnessing the incidental, and operating with a self-avowed ‘painterly and deliberate attitude’. He questions the imperatives of image-making by creating beautiful images through a combination of mischief, chance and a highly refined visual sense. Each artist turns the impetus to work with the products of contemporary cultural systems into highly individualistic techniques. Haroon Mirza draws on eclectic sources such as contemporary music, religious practices and the history of art, subtly modifying and combining his materials to create heterogeneous but ultimately harmonious assemblages. Paradise Loft (2009) is a multimedia installation in which sound, light, moving image and sculpture come together in an immersive environment inspired by the cultural history of dance clubs. On one level, the work pays homage to two seminal New York nightclubs, and specific producers and DJs associated with the 1970s dance scene. Its title is a portmanteau of The Loft and Paradise Garage, cornerstones of the scene and testbeds for musical innovation. The work features video footage of two key players of the time: record producer Arthur Russell and Francis Grasso, the inventor of beatmixing, the definitive technique used by contemporary DJs. Beatmixing involves matching the tempo of a cued record with the record being played out to create a seamless transition from one track to another. Mirza uses this technique on a video of Grasso, editing it into rhythmic sound bites so that the footage shudders in tempo with the other sounds coming from the work. Paradise Loft also includes a salvaged air-conditioning vent from the Gatecrasher club in Sheffield, which was destroyed by fire in 2007, and a work of art by Giles Round, a sculpture made from electrical flex strung between the floor and ceiling of the gallery to spell MW, which is the frequency-range setting of a radio also used in the sculpture. These elements add to the fertile mix of references and sources that animate the work. By bringing together such a wide variety of cultural artefacts, Mirza performs a figurative beatmixing, which produces unexpected and rewarding sensory and conceptual frictions. The idea of nonlinearity is useful for thinking about the different ways in which artists use and create systems. The most exciting aspect of this kind of approach is the wide range of unexpected occurrences, tendencies and outcomes that emerge over time, and that constitute the actual ‘art’ of the work. By surrendering a certain amount of control to the systems, these artists admit that the artworks they produce have a life of their own, and a life beyond the studio in which they were made. Incorporated into a collection of contemporary art, placed in relation to works by other artists, laid open to analysis by interested spectators, these works never stop growing or producing new meanings. As part of an exhibition, they become subsumed under a new banner, playing a role in a systemic composition that is influenced by the building in which it’s installed, the various publics that come to visit, and a wide network of art world and media relationships. The hope is that the encounters people have with these works will transcend their immediate space and time and continue to produce new ideas, emotions and relationships. This entry was posted on July 5, 2010 by ellendw.